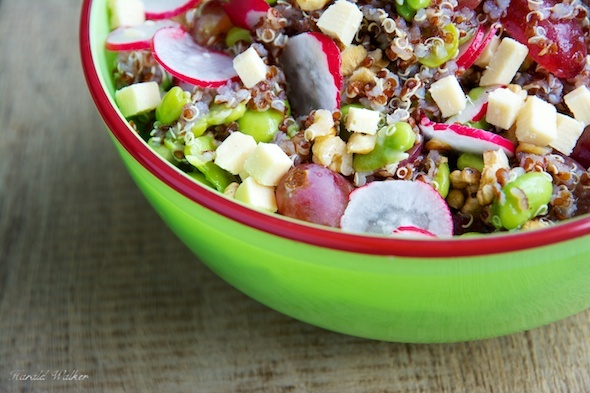 This protein packed salad tastes as great and refreshing as it looks. We have really been enjoying this salad. Place the quinoa in a saucepan. Add the 3 cups of water and a pinch of salt and cook until the quinoa is soft. When the quinoa is done, remove from the heat, drain well and place in a bowl. Prepare the fava beans, if they are fresh, remove from the pods, if frozen, then open the box. Prepare a sauce pan of boiling water and blanch the favas. When they begin to float in the boiling water, plunge them into cold water and allow to cool. Once they are cool, remove the skins. Add the skinned fava beans to the quinoa. We made the salad the day before so that the seasoning would marinate the salad. If you choose to do this then make the dressing at this stage. To make the dressing, blend the dressing ingredients together, then pour over the quinoa and beans and mix well. Then cool in the refrigerator until ready to serve. Just before serving the salad, wash and slice the grapes, chop and toast the walnuts. Clean and thinly slice the radishes and cut the soy cheese in small pieces. Bring the salad together by adding all the prepared ingredients and gently mixing. The salad can be served in a bowl, or on a bed of lettuce or salad greens. Edamame can be used stead of the fava beans, and pecans can also substitute for walnuts. 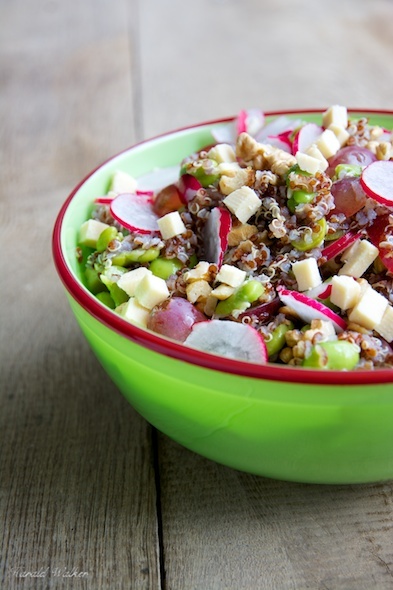 Posted by Chris Walker on June 5, 2013 in Grapes, Quinoa, Radish, Salads, Soy cheese, Walnut.